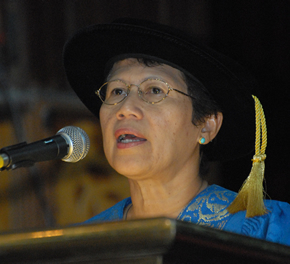 BANGI, 8 July, 2010 – Universiti Kebangsaan Malaysia (UKM) with its good mix of students which reflects the country’s racial composition is a good model of ethnics relations and unity, said the Vice Chancellor Prof. Tan Sri Dr Sharifah Hapsah Syed Hasan Shahabuddin today. The university’s management is also working closely with the Student’s Council to organise various activities that can further enhance solidarity and unity among the students. Speaking at the Pledge Ceremony for the new students intake for the 2010-2011 academic session this morning, the Vice Chancellor said the new students should strive to not only succeed in their studies but should also be good model citizens who are responsible and morally well-behaved. She also stressed that globalisation should make them be more open to the outside world making it necessary to understand various cultures and languages to succeed. In the light of such challenges UKM, following its succes in making the National Language a language of knowledge, is providing opportunities to its students to learn and be proficient in at least one global language. Prof Sharifah Hapsah advised the students to seize the opportunities provided to study other languages like participating in the English Speaking Zone requirements at the residential colleges. “You must remember that the ability to be good communicator holds the key for success in the future”, she said. She also advised them to grab the opportunities provided by the university through its Mobility Programmes in offering double degrees with foreign universities. 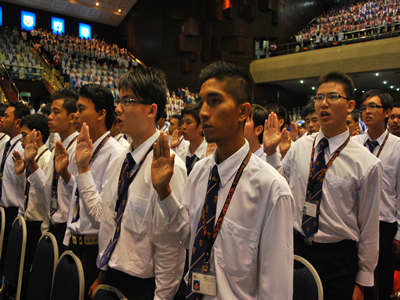 Prof Sharifah Hapsah told the 3,274 new students that UKM does not only produce graduates who achieve academic excellence but also wants them to be responsible members of society sensitive to the diversity of the population. Besides learning, students should also get themselves involved in various co-curicullum activities including sports, games, the arts and cultural activities as well as being active in the various students organisations. Such activities can help promote good values and give them experience in taking the professional approaches to resolving issues and making sound decisions. “Students must also uphold the law and the university’s procedures and rules besides using the proper channel to air complains or grievances. “Use the forums that exist like e-warga, facebook and students’ council to air problems or grievances and not be easily influenced to be pulled by the nose,” she said. The one hour ceremony was also attended by Chairman UKM Board of Directors, Tan Sri Dato Paduka Dr Mazlan Ahmad, the Deputy Vice Chancellors; Professors, Deans and College heads who were introduced to the new students.